It is spring and you've just turned over your winter green manure, double dug your beds, and transplanted seedlings. The soil looked perfect, the sprouts just taking off, and suddenly, out of nowhere, destruction and havoc! You've got gophers. As a caveat, I admit that I've never used poison or gopher traps because I don't believe a gopher must be killed, at least in a vegetable garden. I know my approach wouldn't work if gophers were ruining a manicured lawn, but that is a different story. The most effective method of garden protection I have found is to line beds with hardware cloth. Hardware cloth is a sheet of galvanized metal fencing material. The easiest way to do implement this method is to build raised beds and nail hardware cloth to the bottom of the raised bed. An alternative is to dig out trenches where your beds are and line those trenches with hardware cloth, and then back-fill (which is no easy task). The obvious disadvantage is the expense and labor involved in such a project. Nowadays there is also a commercial product sold under various names like “gopher basket,” a preformed underground chicken wire “basket” which you can simply plant your seeds or seedlings in. Since I incorporated hardware cloth into my garden, the gophers have finally left it alone. This is the method I recommend if you have the time, energy, and money. I've seen a local cat catch a gopher and toss it around like a rag doll. A wily cat can definitely help eliminate gophers in a circle-of-life kind of way. In addition, dogs and owls will catch gophers when given the opportunity. These methods work if you've already got the predator around... if not, it's probably not worth it to go out and get a cat in order to catch the gopher, and it would likely take too long to attract owls to the area. There is another category of “humane” methods (which I have not personally tried) that are much easier to implement than subterranean hardware cloth and may be worth a go. These are devices which produce noise or vibrations underground, like pinwheels or ultrasonic devices. They are meant to scare the gophers away from that area. Sounds interesting. The following are some common techniques which you may consider because of their ease, but which I have tried without success. There is a poisonous plant called Euphorbia lathyris or more commonly Gopher Spurge or Gopher Plant. They sell it at some nurseries as a gopher repellent. The idea is that you plant this plant around your garden and the gophers either stay away from it, or eat it and die. All I can say it has spread itself around like a weed rather generously at the community garden and yet the gophers still feel at home there. Some gardeners are very fond of the flood-'em-out method method of gopher control. With this method, you stick a hose into the gopher's tunnel and let it run until the water backs out the hole. The idea is that gopher is either drowned or is forced to crawl up on the surface, where you can catch it. The only problem is that this method is not 100% effective. Not to mention the amount of water it consumes ... 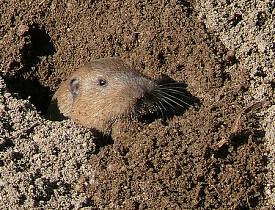 I've seen some gopher holes take water from a full-blast hose for 40 minutes or more (according to the University of California Agriculture and Natural Resources website, a gopher burrow can span 2,000 square feet).